In 2006, 48 million students were enrolled in public schools. Ten million of them are Hispanic.6 Overall, two-thirds (67%) of all students are enrolled in kindergarten through grade 8 and the remaining third (33%) are enrolled in high school (grades 9 through 12). The grade distributions of Hispanic and non-Hispanic students are similar, although a greater share of Hispanic students (70%) are enrolled in grades K through 8 than non-Hispanic students (66%) and a lesser share of Hispanic students (30%) are enrolled in grades 9 through 12, compared with non-Hispanic students (34%). This is partly due to the fact that school-aged Hispanic children are younger than school-aged non-Hispanic children. The average age of Hispanic school-age children is 10.8, compared with an average age of 11.2 for non-Hispanic school-age children. 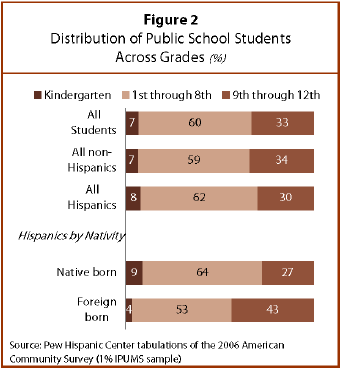 The distribution of Hispanic students across grades differs greatly by nativity. Of the 1.6 million Hispanic public school students born outside the United States, more than 43% are enrolled in high school. In comparison, 27% of the 8.3 million native-born Hispanic students are enrolled in high school. Foreign-born Hispanic students are half as likely as native-born Hispanic students to be enrolled in kindergarten (4% versus 9%). The skewed grade distribution of immigrant Hispanic students is largely explained by the fact that they are older than their native-born counterparts. The median age of immigrant Hispanic students enrolled in public schools is 13, compared with 11 among native-born Hispanic students. In 2002, 75% of Hispanics said that discrimination was a problem in schools. Just five years later, in 2007, 84% reported the same. Although discrimination in schools was viewed as problematic in 2002 and 2007 by a strong majority of respondents, the percentage of Hispanics who believe it is a major problem rose over the five-year period, from 38% in 2002 to 64% in 2007. Despite concerns about discrimination, the 2004 survey found that the majority of Hispanics were satisfied with public education. When asked what grade they would give the public schools in their community, Latino respondents were more likely than either white or black respondents to give high ratings. Nearly two-thirds (63%) gave the public schools in their community a grade of A or B, compared with 58% of whites and 48% of blacks. Analysis of public school data finds that since 1993-94, white students have become less isolated from minority students while, at the same time, black and Hispanic students have become slightly more isolated from white students. These two seemingly contradictory trends stem mainly from the very large increase in the Hispanic share of the public school population since 1993-94. This report documents the nation’s recent public school building surge and the composition of enrollment in newly opened schools as well as older schools still in operation. It also examines the impact of rapid growth in Hispanic enrollment and finds that a relatively small number of public schools absorbed most of the increase in Hispanic enrollment. Those schools differ in important ways from schools less affected by Hispanic population growth. The Nation’s Report Card: Mathematics 2007 and A Profile of the American High School Senior in 2004: A First Look. Initial Results From the First Follow-up of the Education Longitudinal Study of 2002 (ELS:2002). These government studies indicate that the achievement scores of Hispanic students lag well behind those of non-Hispanic white students and that large shares of Hispanic students have below-basic levels of proficiency in math and reading. According to the most recent National Assessment of Educational Progress (NAEP) of the U.S. Department of Education, the gaps in reading and math achievement between Hispanic and white students were not measurably different in 2007 compared to the early 1990s.